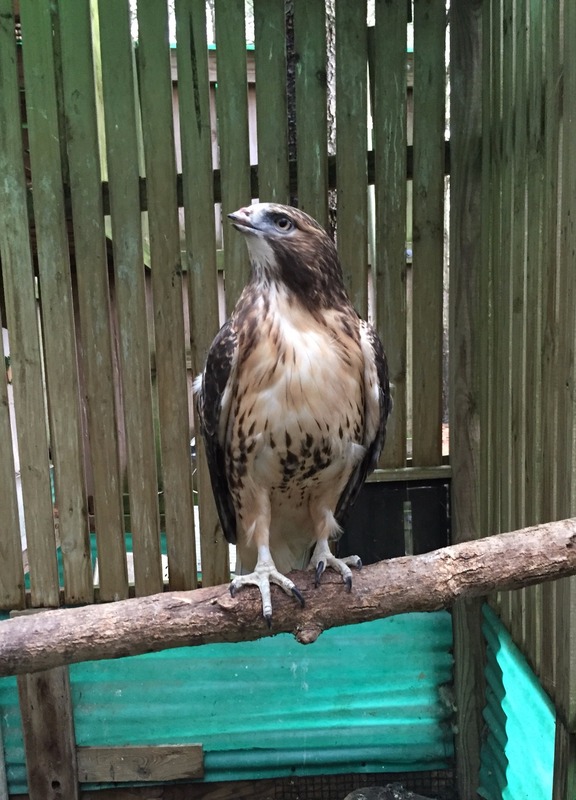 This Red-tailed Hawk came to us on 8/30/2015 after flying through a methane gas plume. Unfortunately this is an injury that we have been seeing more recently, this being our third case in two years. Methane gas burns clear so a bird cannot see it when they are flying over it. In addition, raptors do not have a strong sense of smell so they cannot smell it to avoid it either. As soon as a bird flies over one of these plumes their feathers instantly singe off and they fall to the ground like a rock. Our previous two cases of methane burns have been success stories but this bird is by far the worst case we have seen. You can clearly see in the pictures that he has severe feather damage; the heat was so intense some feathers actually started to curl. He also has severe burns on his cere (the skin above the beak) and his feet. Our main concern right now are his feet and legs, the burns are severe enough that we need to soak his feet in a medicated bath every day, though he is making great progress towards recovery. 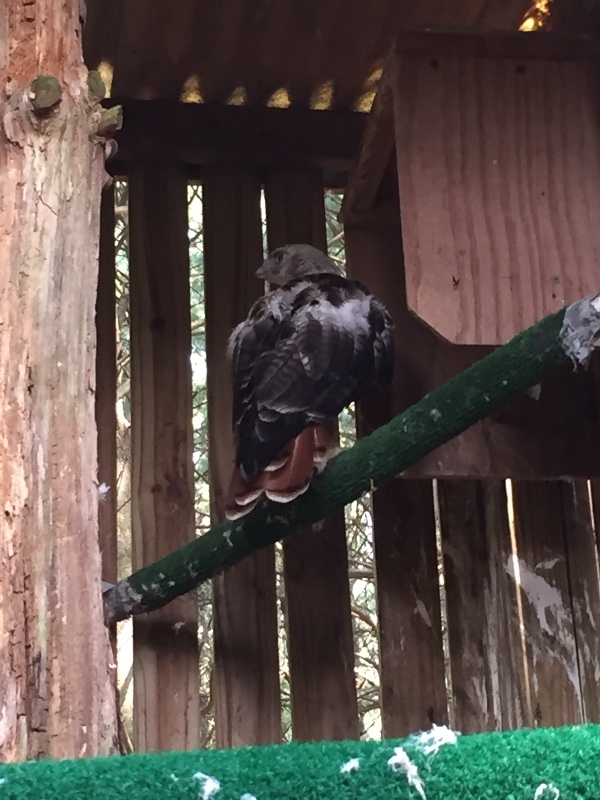 The skin on his cere has fallen off and he will most likely lose the keratin covering his beak. The vets believe this keratin should grow back in time. While he is extremely feisty and is making more progress than we had anticipated we are in it for the long haul with this bird. Once the skin on his feet heals he is looking at 2 plus years in rehab before all of his feathers come back in. 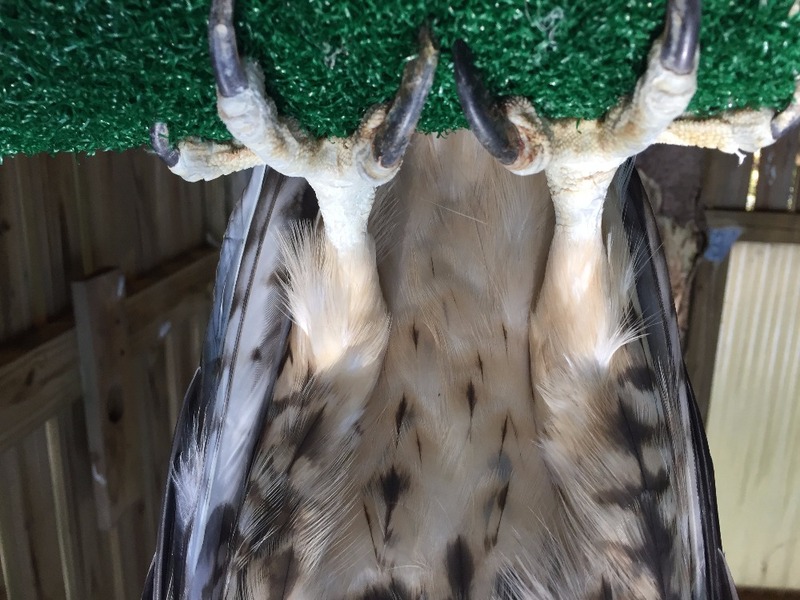 One of the issues we may face once his feathers begin to grow again is a very strong chance that the shafts may so badly damaged that they will turn the wrong way or fall out completely. Only time will tell. The thing that makes this case so heartbreaking to us and at the same time makes us want to work so much harder to bring him back to full health is that this injury is 100% caused by man and there is really nothing that can be done to prevent it. We can’t even imagine what it must be like for these majestic creatures to be flying freely one minute and falling to the ground in what must be excruciating pain the next, not knowing what happened. While this bird was lucky enough to make it to us it is unknown how many other birds are not so lucky. With time and some great medical care we are incredibly hopeful for a full recovery. 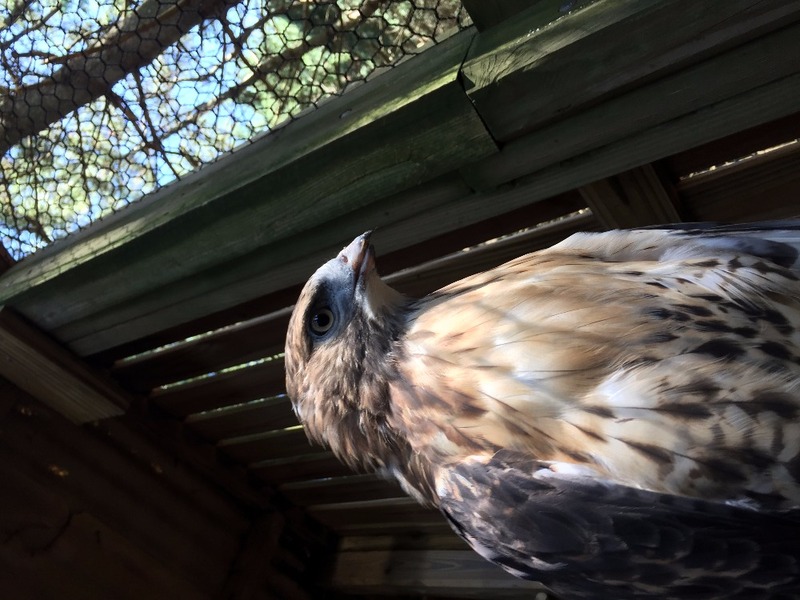 During this bird’s stay with us he will need several trips to the vet, this winter he will need to be housed inside our center with specialized UV and fluorescent lighting, and he will need lots of food. If he is in fact with us for the 2 or 3 years, we are anticipating his care will cost us upwards of $3000. 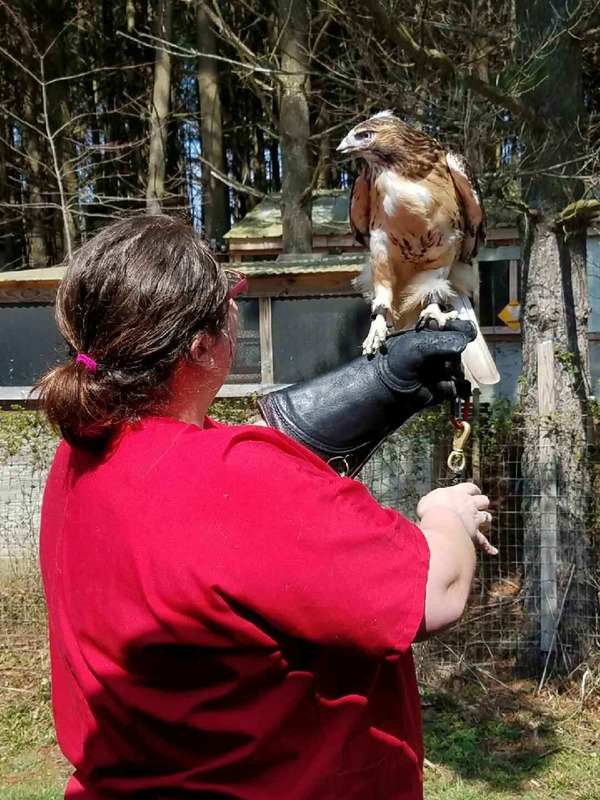 It is all worth it when we are able to release these birds, but it makes your support and donations all that more important in the recovery of these creatures. We will be sure to keep all of our supporters updated on the process of this beautiful bird, “Valor”. This is the first day of the rest of her life. Valorie began her training today to officially become an educational ambassador and she did so with flying colors. She is adapting better than we ever could have expected. This will be a daily endeavor and will take time like the rest of her recovery but she will be able to spread her story and a message of conservation far and wide. We can't wait to have you all meet her in person! Valorie is still with us. She is looking great but is a bit on the heavy side. Today she took a trip to the vet to get an opinion on her beak. The vet told us what we had feared, her beak will not regrow to where she can ever be released into the wild. We are looking into some alternative options to keep her happy and healthy. She will require some special care for life since she is unable to tear at food in order to get it small enough to swallow. We are not giving up on her but she is quite the challenge. We will keep you posted as things progress. This lovely lady doesn't look like the same bird anymore. She did something incredible which is molting in almost all of her feathers in one season. 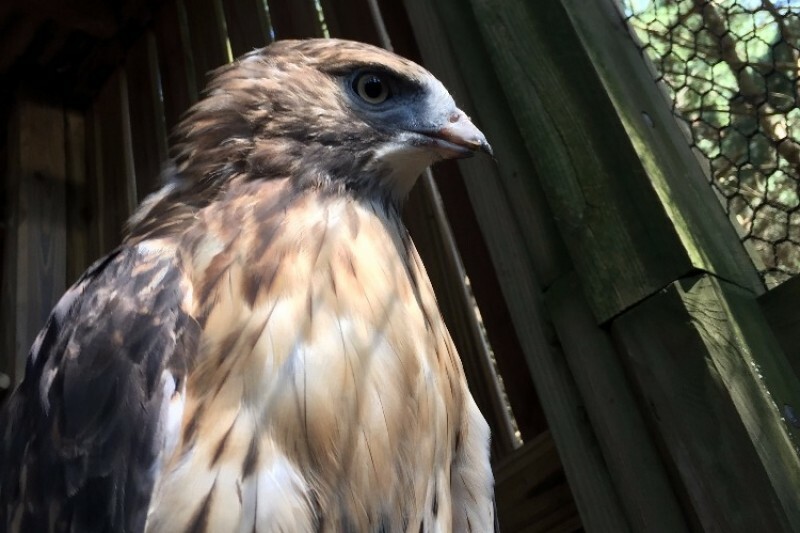 She looks like a truly majestic red-tailed hawk again. As you can see her beak still needs a bit of work but we are hopeful that if her talons can grow back so beautifully so can her beak. Our beautiful girl is doing great! Look at those new feathers! Terrific Red-tail! Many thanks to you and your staff, Laura! Thank you for everything you do to help the animals! You're looking good, Valor. Keep fighting!